Infectious diseases in the adolescent are most often localized in major joints of the extremities. However, the spine occasionally is involved in suppurative osteomyelitis which can either be acute, chronic, or focal (Brodie’s abscess). The spine can also be the site of nonsuppurative osteomyelitis in the form of tuberculosis, brucellosis, and different types of fungal infections of bone. 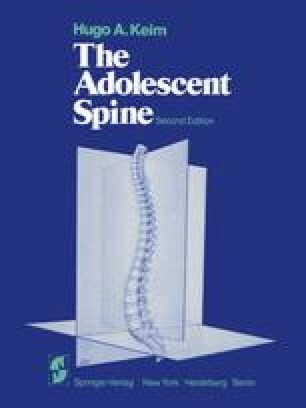 Perhaps the most disturbing form of vertebral inflammation is that involving the disc space in the adolescent. Disc space infections are a relatively uncommon disease in the child, but always present a diagnostic challenge. Many reports of intervertebral disc infection in children emphasize the relatively benign nature of the condition and in most instances the problem resolves spontaneously but involves difficult diagnostic procedures and major decisions regarding treatment. The etiology of disc space infections is generally considered to be an infectious agent, most frequently hemolytic (Staphylococcus aureus). In adults this organism is present in approximately 70% of patients. In children, however, it is difficult to demonstrate the organism and very few disc space infections ever culture a specific bacterium, even after needle and open biopsy of the involved intervertebral disc.